When my daughter was baby, I was often not sure which spices to add in her food. Turmeric and cumin were the safest ones and I added them to most of her food, but I was hardly sure if I should add some more spices to her food. Also, garam masala is required in a number of recipes and I did not want to add the store-bought one as it usually has plenty of dried red chillies. I started adding more spices as she grew and tried this spice powder or garam masala meant for her. It was home-made and I knew exactly what went into it. I also did not add chillies to her food till much later and this way I could ensure they are not there. Instead, I always prefer to add black pepper in her food for a little kick. Today, I am sharing with you guys this simple garam masala or spice-mix powder which can be added to any number of curries, gravies, veggies, rice dishes etc. when you want to spice things up for your baby or toddler. Moreover, this spice mix uses spices which also help in digestion and relieve conditions like gas and reflux. Make sure that all the spices are clean. Dry roast all the spices on the for a few minutes, one by one. Roast on low to medium heat. You know they are ready when they change colour slightly and release an aroma. Allow all the spices to cool down completely. Add all the cooled down spices into the spice jar of your grinder. Sieve it to make sure there are no big pieces. Store this spice mix in an air-tight container. You can use this garam masala for 2-3 months. 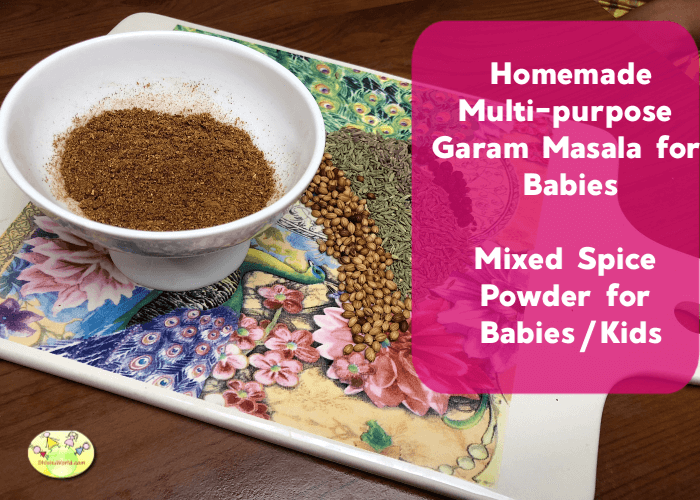 How to use the mixed spice powder or garam masala for babies? This mixed spice powder or garam masala can added to curries, dal, khichdi, pulao, paratha etc. Just add a pinch of this to any recipe at the end and mix well. It is also good for those kids who dislike seeing cumin seeds or ajwain in their food. This garam masala not just provides yummy taste to baby’s usually bland food, but also has a lot of other benefits, which are due to the individual ingredients of this powder. Jeera is the most common spice along with turmeric that is used in Indian cooking. Prevents anemia as it is a good source of iron. Fennel seeds or saunf is a well-known digestive aid. It also helps in relieving colic. This garam masala is a one stop solution for all mothers who wonder which spices to put in their children’s food. It will enhance the taste of the rice, khichdi, pulaos or porridge that you are making. Do not add too much. A pinch or two enough for one serving of food. You know your baby best. Could you please suggest me that Garam Masala is it safe for baby? and is it has any side-effect for baby? Can I mix this Garam Masala spice powder in every foods? I worried about this matter. Yes, it is safe to be used after 8-9 months. Add just a pinch in the beginning and gradually increase the quantity.